Caiyun Road is 80 metres wide with 10 lanes of traffic. The traffic-clogged expressway to Kunming’s newly emerging suburb of Chenggong typifies China’s recent approach to urban planning. Tranformation plans for Caiyun Road are one example set out in a new book by Peter Calthorpe, an architect and planner, tasked with producing an alternative vision for the town of Chenggong, southeast of Yunnan's provincial capital, Kunming. In Transit Oriented Development in China - A Manual of Land Use and Transportation of Low Carbon Cities, Calthorpe argues that there are more effective ways of dealing with congestion than simply widening roads. His “new urbanism” philosophy says that car-centred city planning places excessive burdens on the economy and the environment and advocates “cities designed for people, not cars". Calthorpe and his two co-authors – Yang Baojun, deputy director of the Chinese Academy of Urban Planning and Design, and Zhang Quan, deputy head of the Department of Housing and Urban-Rural Development in Jiangsu Province – set out to explain, and inspire, transit-oriented development (TOD) to avoid long-term problems as China’s cities grow at warp speed. “It’s time for China’s car-centred urban design and management to make way for a people-centered approach. TOD is one practicable way of doing so,” says Yang. He adds that China’s cities have been used as economic growth machines and contributed greatly to expanding GDP, but that residents are now unhappy with the congestion and pollution around them. Although China has already invested heavily in public transport, approaches to land use still promote the take-up of cars and create urban spaces that fail to foster walking or cycling. Calthorpe Associates’ project envisages Chenggong as a city that does not revolve around the car. Instead, the design includes plenty of smaller, human-scaled streets, well-suited to pedestrians and bicycles, with good access for buses and plentiful greenery in inter-linked parks. Caiyun Road may be rebuilt, cutting down the number of lanes to create a linear park sandwiched between two parallel one-way roads, a system known as "one-way pairs". There would be three-lane roads; one lane for cars; one for public transport; and one for pedestrians and cyclists. To ensure overall capacity does not decrease, some nearby streets would also become one-way, dividing traffic that currently clusters on one street across several one-way routes. 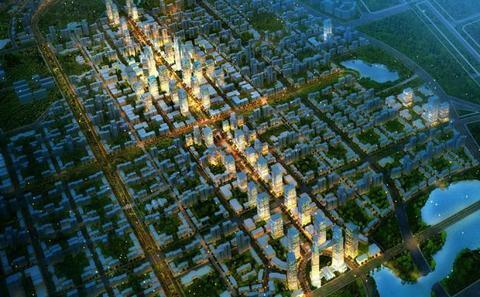 Besides transportation, the other major focus of TOD in China is land use. The approach rests on eight guiding principles for urban design: creating walkable streets and neighbourhoods; prioritising cycle routes; increasing road density; developing quality public transportation; building mixed-use neighbourhoods; deciding population density in line with transit capacity; providing quick commuting options; and adjusting parking and road use to increase flexibility. China is frantically building expressways, ring roads and car parks to meet the needs of cars, says Calthorpe. But China’s high population density means the problems of car use are more concentrated than in Western nations. In Beijing, a vast number of new roads are built each year, but congestion is still a major problem.